Garry Goodman and "Tap Dance On A Cloud" will be in the January 06' issue of Bassics Magazine and on the Bassics Compilation CD. After testing the new G4 and Ab4 string for several weeks, I discovered that the new string wire allows for something I never expected. If I fret the highest string when tuned to G4 at the pickup cover, I can play the note C8(around 4Khz). The distance from the the 36th fret to the pickup cover is roughly 1/2".Now I just discovered that just by touching the string in that 1/2" space, I am able to play Ab7,A7,Bb7 and B7 just by touching the string without having a fretboard or frets underneath. There is no change in timbre or tone from the G7 on fret 36 to the C8 on the edge of the pickup cover. So the range of this Adler 12-string is from C0-C8,the same as the 97 note Bösendorfer grand piano. Tuning C#0-C#8 gives me one note higher but I loose the C0 and miss having the E-A-D-G tuning for my 4 highest strings. So I can safely say this "Concert Grand Bass Guitar" has the widest range of any electric guitar or bass guitar. The electronics are state of the art. Mike Adler designed a bridge with a clamping system because no string company could wind a ball end on my .004 or .005 string wire for the highest string. This string works well and tunes up nicely to G4 at the 32" scale side of the fan . I will most likely be able to offer the 4 string with octave "12 string"
bassist's a triple octave string set soon. The neck is less than 3/4 " of an inch thick and not as wide as the 11-string. This bass guitar is very easy to play. I can now play "Maple Leaf Rag' exactly where a pianist does because I have the high Ab (6). I am in the process of writing a book on playing this and other piano pieces on the 12 without changing one note from the original piano sheet music. Adler used hot rod/motorcycle paint for the finish. It is easier to play two handed style because there are more locations on the fretboard for the same note now. When I had the 7 string made, 4-1/2 octaves seemed like a wide range. I can really have fun with the 12 string because there are few limitations. I am in the process of creating a new dampening system for touch style playing. More on that later. five of the CD tracks on November 28th. "Garry Goodman at Skip Saylor Recording ,Sept. 04. " music. Ivan was chosen for the project because of his vast knowledge and ability to play percussion instruments in his diverse collection from around the world. tune. 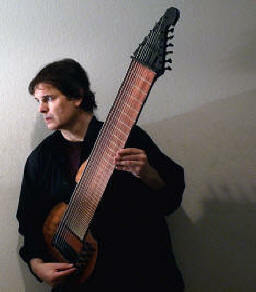 All other tracks were recorded using the Tobias 7-string bass guitar. On Garry's tune "Kona Blend" , he uses a two handed piano style technique, switching to his Percussive Harmonics for the C section of the tune. 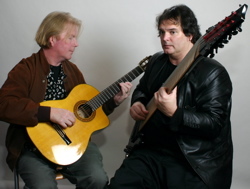 Check out nielsen-goodman.com for early recordings of some of the tunes. Other tunes composed by Garry for the CD include "Can I Keep This Dream? " , "Haleakala" , "Angelita" and "Tap Dance On A Cloud". For those of you interested in the history of the Bass Guitar , this CD contains recordings of both the very first 7-string bass guitar ever made and the first 11-string bass guitar.